Our Medium Storage Basket is the perfect addition to schools, offices and even domestic environments. It offers a medium-sizes capacity to store a range of different items securely and in a compact manner. These baskets are constructed from a lightweight but durable plastic. This allows them to be cleaned easily with antibacterial wipes or spray. In addition, they have an open cut-out design which allows you to identify the contents, even when stored up high. 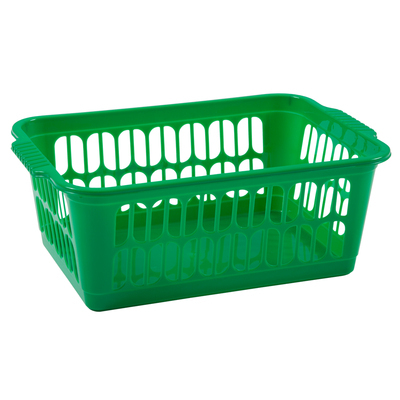 Here, the storage basket comes in a bright green making it suitable for use with colour coordinating set-ups. Here at Gompels, we offer a wide range of storage options for your business. From our large pack of 10 Storage Containers through to our Gompels Flexi Trugs, we have everything your business will need to get organised.